A glimpse of Mill Pond in West Tisbury as I drove up-Island caused me to think about the effort by a determined group of residents to restore the historic waterway to a free-flowing stream. Their progress has been slow, but not nearly as difficult as that of the herring that continue to struggle to return to their natal waters each spring up and down our coast. The offspring of those that survived the journey have by now begun their return to the sea. It is a natural cycle that man has interrupted along our coast to the detriment of a variety of species that include striped bass. Fisheries management cannot succeed on the large scale if we do not think about the small scale, and do what we can to protect waterways — from the smallest brook to the largest river — from degradation. 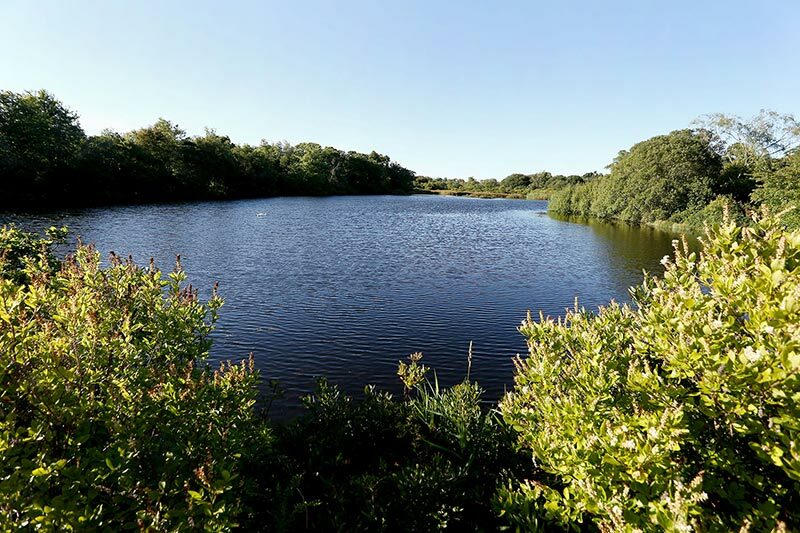 Herring and white perch spawn in the lower reaches of Mill Brook, and native book trout cling to life in the upper reaches of the stream that begins in Chilmark, passes through several artificial impoundments in West Tisbury, such as Mill Pond, and streams into Tisbury Great Pond. There is also evidence that American eels still manage to use the stream. Last May, with assistance from the state Division of Marine Fisheries and a group of volunteers, West Tisbury erected a fish ladder at the dam. How successful it is in allowing fish to navigate this obstacle remains to be determined. However, fish ladders are not a solution. They are a compromise intended to mitigate the harmful effects of a dam. For example, in the northwest where dams help provide valuable hydroelectric power, fish ladders are used to help maintain passageways for salmon — not so successfully judging by the continued decline in salmon numbers. As a result, there is a concerted effort by conservation groups to remove as many dams as possible. Removal of the Elwha Dam in Olympic National Park, billed as the largest dam removal project in the world, has led to the return of salmon for the first time in a century in that river. The Mill Pond, which warmed to more than 80 degrees this summer, is a case in point. 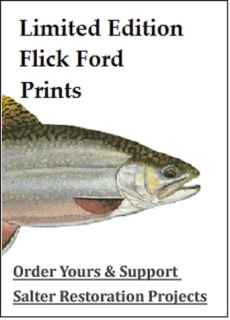 We have no salmon, but we certainly have brook trout. That they survive is a testament to their resilience. At one time in our nation’s history, progress was measured by how much we could extract from the environment. We erected dams on rivers and streams to pull power from the water with little thought about the consequences, which seemed minor compared to the benefits. In the last century that equation and our understanding of it began to change. Today, the removal of unused dams attracts positive attention. In June, state and local officials celebrated the successful removal of the 84-foot long Bartlett Pond dam on Wekepeke Brook, a tributary of the North Nashua River, restoring upstream fish passage to approximately 18 miles of high-quality coldwater habitat. “With the dam’s removal, there has been an immediate return of native brook trout to the restored stretch of the river,” state Fish and Game Commissioner Mary Griffin said. “Removing dams helps restore healthy rivers to provide clean water, reduce risks, enhance recreation opportunities, and preserve wildlife habitat,” said Wayne Klockner, State Director of the Nature Conservancy in Massachusetts, which has an office on Martha’s Vineyard and is in a position to comment on at least one Mill Brook impoundment. Earlier last spring, the state’s office of Energy and Environmental Affairs (EEA)designated eight new river and wetland restoration projects across the state as Priority Projects, which qualified them for grants and contracted technical services funded by the Division of Ecological Restoration (DER). 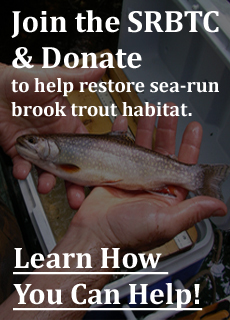 The goal in almost every case included restoring habitat connectivity and flow to benefit fish species. “River and wetland restoration projects improve habitat for many species of fish, such as brook trout, blueback herring, alewives, and rainbow smelt, that support recreational and commercial fisheries,” Ms. Griffin said of the designations. The list included a partnership with the Sheriff’s Meadow Foundation to restore connectivity to the headwaters of Mill Brook by removing an earthen dam on the Roth Woodlands Property in Chilmark. It is the type of small-scale project that could prove meaningful in the future. 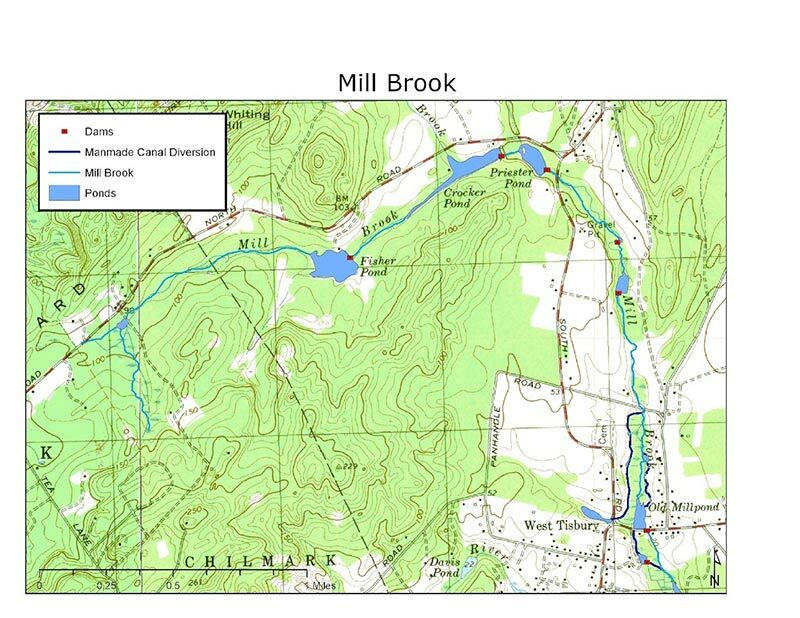 This map shows the various dams and impoundments that impede the flow of Mill Brook. The September/October issue of American Anglermagazine included an article by Morgan Lyle about the mounting effort to oppose a $5.19 billion hydroelectric project proposed by the government of Alaska. “An Alaskan proposal to dam the mighty Susitna River bucks the dam-demolishing trend in full swing from Maine to South America,” Mr. Lyle wrote. I have to think it would also be good for West Tisbury.